The Vita has had its fair share of ports in its comparatively short lifespan, but sometimes these ports have been so well done that they are the “ultimate” version of the game. Tecmo Koei has made quite a practice in bringing its console games to the Vita, as we’ve seen with Dead or Alive 5 Plus and Atelier Totori Plus. 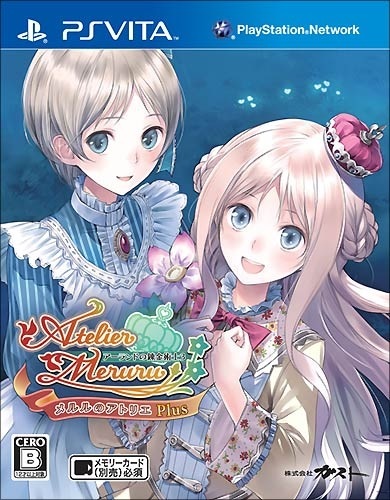 Now they’ve brought over the ‘Plus’ version of the last game in the Arland series, Atelier Meruru Plus, but is it worth the download? For those familiar with the game, the story will be quite familiar to all of you, but for newcomers to the game, Meruru is the princess of the Kingdom of Arls. However the kingdom is so small and so far behind the times, to the point where they have almost no advanced machinery, skilled villagers or anything unique, that it is going to be absorbed into the Arland Republic in five years. Despite being only a few years away from merging her nation with Arland, Meruru doesn’t really care too much about this problem because a famous alchemist by the name of Totooria Helmond has settled in Arls and Meruru has taken quite a liking to not only her, but her occupation as well. This causes Meruru to shirk her royal duties and run off to Totori’s workshop and become Totori’s apprentice in alchemy. With the help of Totori, Meruru manages to convince her father, the King of Arls, to let her become an apprentice and work on becoming an alchemist under one condition. Meruru must use her skills with alchemy to build the Kingdom of Arls into one that will entice more people to settle in the nation. As such, Meruru must reach specific population counts within a certain period of time to continue learning with Totori. Unlike many JRPGs there is no doom looming over the horizon, nor is there some evil force of nature ready to lay waste to the kingdom if Meruru fails to meet her goals. Instead all that happens is a bad ending where she isn’t able to continue her studies in alchemy. As such while there isn’t such a deeper goal, like Totori trying to find what happened to her mother in the past game, the story is very lighthearted and focuses more on Meruru’s journey to build up her kingdom and the various friends that will help her along the way. 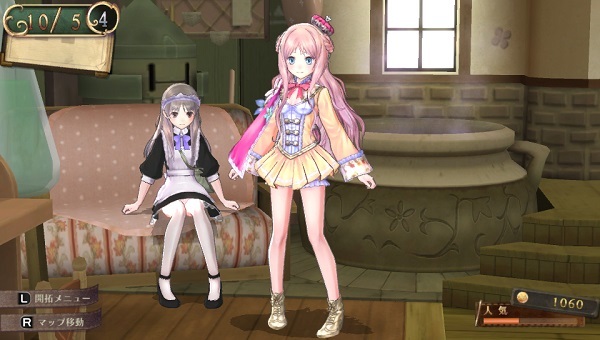 By building up a rather charming cast of characters, and introducing a number of returning characters from Totori and even Rorona herself, albeit a loli version of her, Atelier Meruru Plus offers players numerous characters to interact with and develop relationships with. You see, the game has a rudimentary affection system where special events with characters can be unlocked either by performing tasks with them or taking them on journeys with you. As you make your way through the game, there are numerous endings that can be unlocked upon completion, but it is worth noting that, while a new ending has been added in Meruru Plus, it is still not possible to achieve the best ending without playing through the game more than once. As far as the game’s storyline goes, besides including all of the DLC characters from the PlayStation 3 version and allowing them for use in our party, the story remains very much the same thing found in its PS3 counterpart. 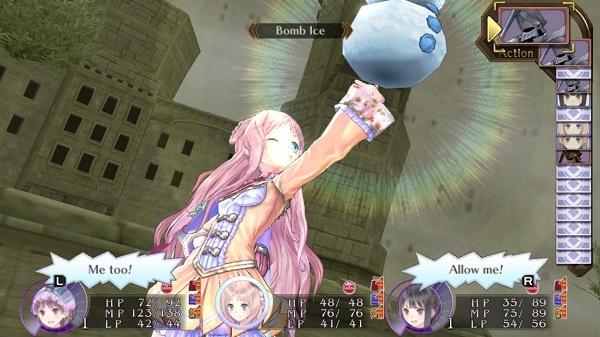 As with every Atelier title, Atelier Meruru Plus is based around a time system. Players are given a time limit where they must reach certain goals within a limited amount of time and time passes whenever the player does pretty much anything. Creating items with alchemy, recovering in bed, fighting enemies, gathering ingredients, traveling between places, all of these tasks take time and as such the player must always keep an eye on the clock when they debate about what to tackle next. 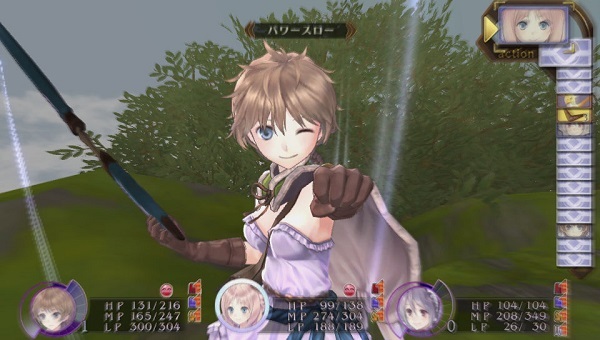 Atelier Meruru splits itself into a few different parts, completing official quests from the King’s right hand man Rufus or accepting quests from the Adventurer’s Guild in the tavern to raise your popularity level with the people make up one part, while gathering ingredients and taking out enemies, also for ingredients and leveling of course, take up another part while the majority of your time will be spent creating items in Totori’s workshop. Interestingly enough, the requests can be anything from picking all of the plain grass from a field, to slaying a strong monster, slaying a number of monsters, slaying all the monsters in a specific area to open up a path or delivering a specific amount of goods, usually ones that have to be created via alchemy, to a specific place. These quests are often varied enough that the player won’t find them too repetitive and once the player completes these requests, they will receive the DP they need to develop the kingdom. If the player’s popularity falls too low, they will find their population dropping, instead of increasing. It is quite difficult to actually allow your popularity to fall that low as a number of these quests are stunningly easy to complete with the help of some in-game stores. There are also a few requests you will sometimes receive from your friends as well, which tend to be a bit more complicated, and completing these requests will boost your friend level as well as provide a nice cash bonus. 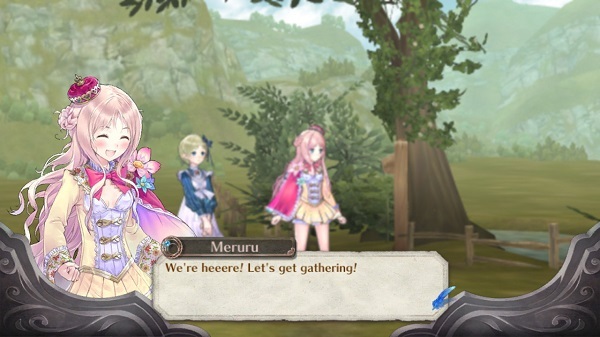 Now while players will be balancing their time between development requests and popularity boosting missions, the core element to Atelier Meruru is still alchemy. 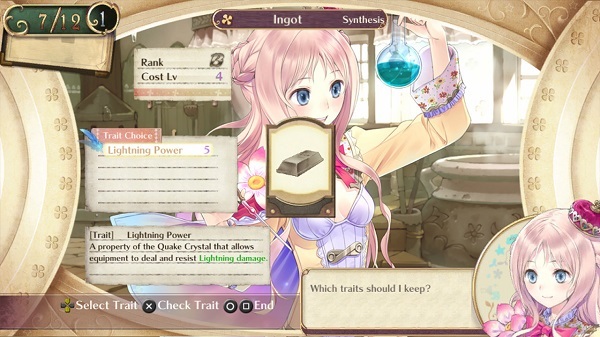 The alchemy system is as great as it was in past Atelier Arland games, as players will have to gather certain ingredients from either out in the field in gathering points, by defeating enemies or even buying them from a store to create items using alchemical recipes. Items with a higher quality will boost the final product’s quality with a higher quality level allowing the item to deal out more damage, heal more or finish quests faster. Thankfully creating items is easier than ever, as Meruru’s recipe book will even show players if a certain recipes ingredients can be made with things they already possess. 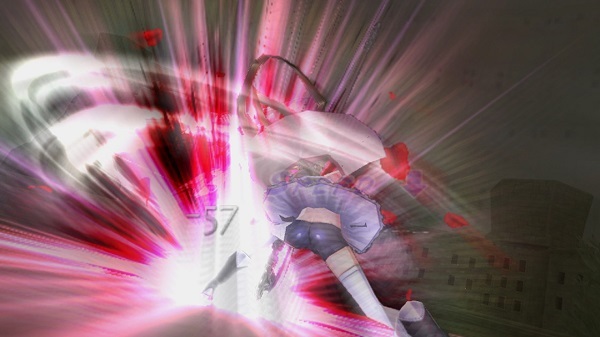 There seem to have been a few tweaks to Meruru’s gameplay as it appeared easier to gather some ingredients and build facilities earlier on and while still difficult at times, some of the more difficult monsters appear to have been taken down a tad to allow for easier entry to some of the more difficult sections of the world. Along those lines with the help of all the DLC characters to choose from and a few new dungeons in this version of the game there is a lot to help you get on your way in the game. Despite being transferred from the PlayStation 3 down to the PlayStation Vita, Atelier Meruru Plus looks as great as it originally did. Perhaps it is thanks to the way that the game’s graphics were originally created, with a soft and varied color palette and detailed, but not overly so, character models used throughout the game, it is simply gorgeous looking on the Vita’s screen. It is worth noting that there is a bit of fan-service throughout the game, but nothing that even comes close to what would be considered legitimate pandering. 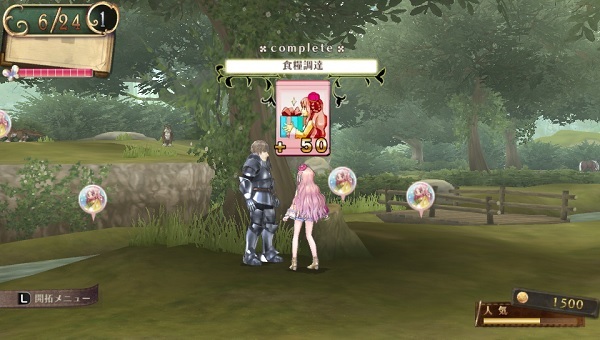 Nothing has been lost in translation as far as the character portraits and battle screens go, as the character portraits remain as detailed and expressive as they can be while the characters remain nicely detailed both exploring the field and entering combat against the various creatures Meruru will have to take on as she hunts down ingredients. It is worth noting that the fields themselves can still be a bit bland at times, but this was also an issue found in the original version of the game. With Atelier Meruru Plus Tecmo Koei has retained the English dub work originally provided by NIS America so gamers will be treated to the game’s old voice cast, which means that it does carry over the same problems that the original version had. That being that the voice acting is hit and miss at best with some of the side-characters having simplistic voice acting but thankfully Meruru’s English voice actress and all returning characters make up for it with their performances. Of course the Japanese voice track is available at any time if players wish to listen to that version instead. As for the game’s soundtrack, it is quite enjoyable with a wide range of background music used throughout the game. Exploring fields or a town will be accompanied with soft adventuring music while the battle music will fit the mood well and even changes in tone whenever a specific battle is going to be a hard one. 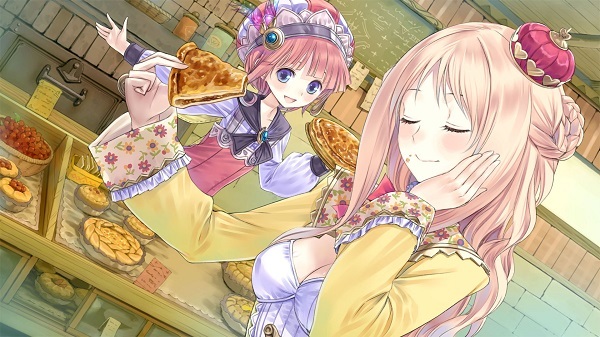 The original Atelier Meruru: The Apprentice of Arland could be seen as the best game of the Arland series and featured an enjoyable cast of characters, an easy to use and understand alchemy and combat system, and gorgeous visuals. 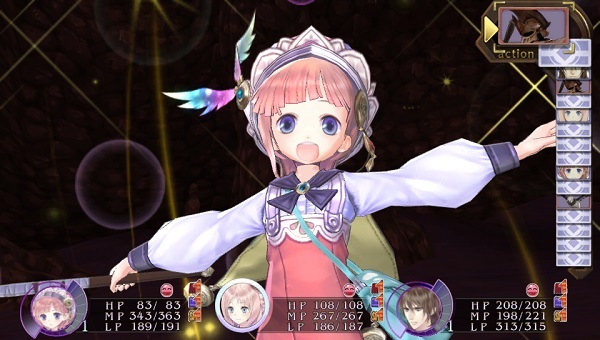 Atelier Meruru Plus’ jump to the Vita has lost none of this in translation and has instead gained not only a bunch of new content that was DLC in the prior version, but some tweaked gameplay all with the added bonus of being able to carry it with you wherever you go, making it a must have game for any RPG loving Vita owner.